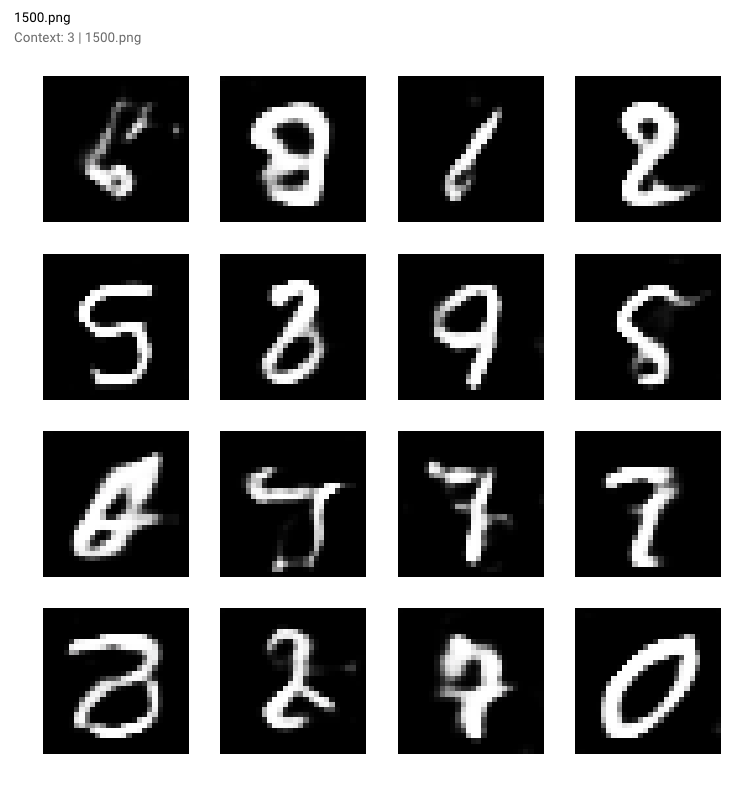 Read how generative adversarial networks (GANs) research and evaluation has developed then implement your own GAN to generate handwritten digits. Generative Adversarial Networks (GANs) have taken over the public imagination —permeating pop culture with AI- generated celebrities and creating art that is selling for thousands of dollars at high-brow art auctions. There is a wealth of resources for catching up on GANs, so our focus for this article is to understand how GANs can be evaluated. 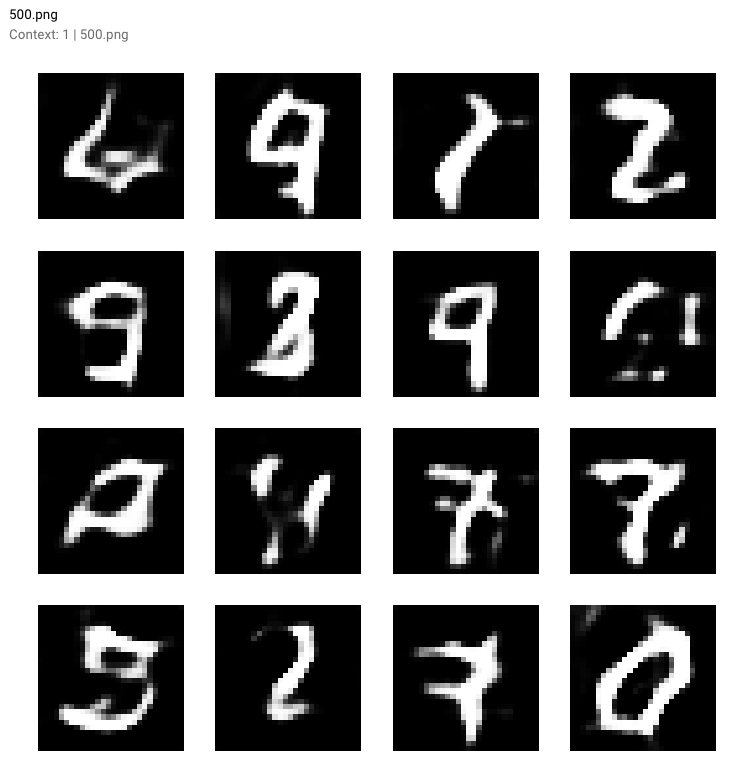 We’ll also walk you through running your own GAN to generate handwritten digits like MNIST. Here’s one run of the GAN we’ll show you how to implement later on — see how the handwritten digits it generates become increasingly realistic as training progresses! Since its inception in 2014 with Ian Goodfellow’s ‘Generative Adversarial Networks’ paper, progress with GANs has exploded and led to increasingly realistic outputs. “GANs have not been applied to NLP because GANs are only defined for real-valued data. GANs work by training a generator network that outputs synthetic data, then running a discriminator network on the synthetic data. The gradient of the output of the discriminator network with respect to the synthetic data tells you how to slightly change the synthetic data to make it more realistic. You can make slight changes to the synthetic data only if it is based on continuous numbers. If it is based on discrete numbers, there is no way to make a slight change. For example, if you output an image with a pixel value of 1.0, you can change that pixel value to 1.0001 on the next step. If you output the word “penguin”, you can’t change that to “penguin + .001” on the next step, because there is no such word as “penguin + .001”. You have to go all the way from “penguin” to “ostrich”. 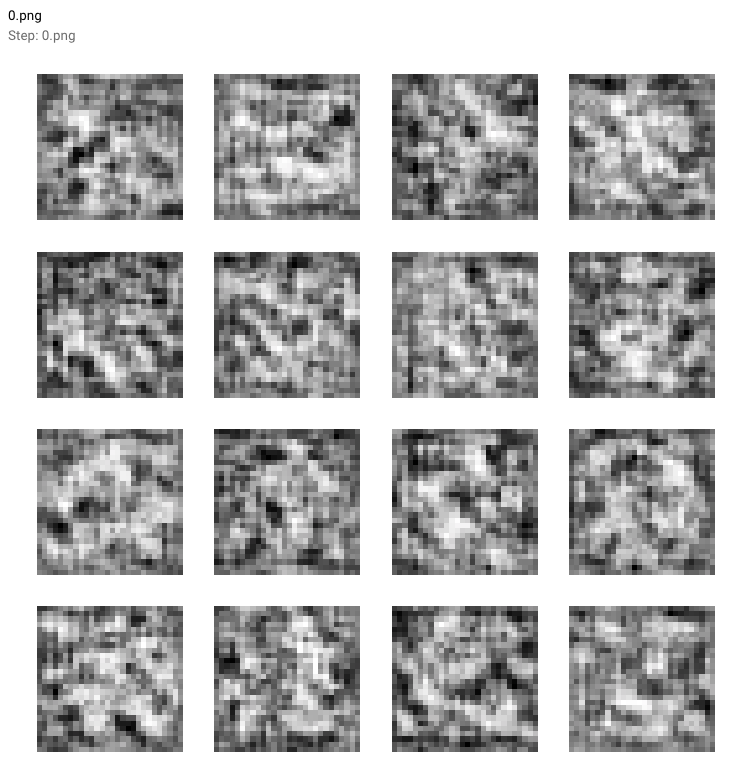 A GAN is comprised of two neural networks — a generator that synthesizes new samples from scratch, and a discriminator that compares training samples with these generated samples from the generator. The discriminator’s goal is to distinguish between ‘real’ and ‘fake’ inputs (ie. classify if the samples came from the model distribution or the real distribution). As we described, these samples can be images, videos, audio snippets, and text. To synthesize these new samples, the generator is given random noise and attempts to generate realistic images from the learnt distribution of the training data. The gradient of the output of the discriminator network (a convolutional neural network) with respect to the synthetic data informs how to slightly change the synthetic data to make it more realistic. Eventually the generator converges on parameters that reproduce the real data distribution, and the discriminator is unable to detect the difference. GAN Lab: Play with Generative Adversarial Networks in Your Browser! Quantifying the progress of a GAN can feel very subjective — “Does this generated face look realistic enough?” , “Are these generated images diverse enough?” — and GANs can feel like black boxes where it’s not clear which components of the model impact learning or result quality. To this end, a group from the MIT Computer Science and Artificial Intelligence (CSAIL) Lab, recently released a paper, ‘GAN Dissection: Visualizing and Understanding Generative Adversarial Networks’, that introduced a method for visualizing GANs and how GAN units relate to objects in an image as well as the relationship between objects. Figure 1 from Bau et. al 2019 showing image modification through intervention with certain GAN units. Using a segmentation-based network dissection method, the paper’s framework allow us to dissect and visualize the inner workings of a generator neural network. This occurs by looking for agreements between a set of GAN units, referred to as neurons, and concepts in the output image such as tree, sky, clouds, and more. As a result, we’re able to identify neurons that are responsible for certain objects such as buildings or clouds. Having this level of granularity into the neurons allows for edits to existing images (e.g. to add or remove trees as shown in the image) by forcefully activating and deactivating (ablating) the corresponding units for those objects. Even though we’re activating the corresponding neurons, it appears as though the GAN has suppressed the signal in later layers. Figure 11 from Bau et. al. 2019 shows how the local context for an object impacts the likelihood of the object synthesis (in this case, the likelihood of a door being generated on a building versus on a tree or in the sky). Another interesting way of visualizing GANs is to conduct latent space interpolation (remember, the GAN generate new instances by sampling from the learned latent space). This can be a useful way of seeing how smooth the transitions across generated samples are. These visualizations can help us understand the internal representations of a GAN, but finding quantifiable ways to understand GAN progress and output quality is still an active area of research. Two commonly used evaluation metrics for image quality and diversity are: the Inception Score and the Fréchet Inception Distance (FID). Most practitioners have shifted from the Inception Score to FID after Shane Barratt and Rishi Sharma released their paper ‘A Note on the Inception Score’ on key shortcomings of the former. Invented in Salimans et al. 2016 in ‘Improved Techniques for Training GANs’, the Inception Score is based on a heuristic that realistic samples should be able to be classified when passed through a pre-trained network, such as Inception on ImageNet. Technically, this means that the sample should have a low entropy softmax prediction vector. Besides high predictability (low entropy), the Inception Score also evaluates a GAN based on how diverse the generated samples are (e.g. high variance or entropy over the distribution of generated samples). This means that there should not be any dominating classes. If both these traits are satisfied, there should be a large Inception Score. The way that you combine the two criteria is by evaluating the Kullback-Leibler (KL) divergence between the conditional label distribution of samples and the marginal distribution from all the samples. Introduced by Heusel et al. 2017, FID estimates realism by measuring the distance between the generated distribution of images and the true distribution. FID embeds a set of generated samples into a feature space given by a specific layer of Inception Net. This embedding layer is viewed as as a continuous multivariate Gaussian, then the mean and covariance are estimated for both the generated data and the real data. The Fréchet distance between these two Gaussians (a.k.a Wasserstein-2 distance) is then used to quantify the quality of generated samples. A lower FID corresponds to more similar real and generated samples. An important note is that FID needs a decent sample size to give good results (suggested size = 50k samples ). If you use too few samples, you will end up over-estimating your actual FID and the estimates will have a large variance. For a comparison of how Inception Scores and FID scores have differed across papers, see Neal Jean’s post here. Interestingly, other researchers are taking different approaches by using domain-specific evaluation metrics. 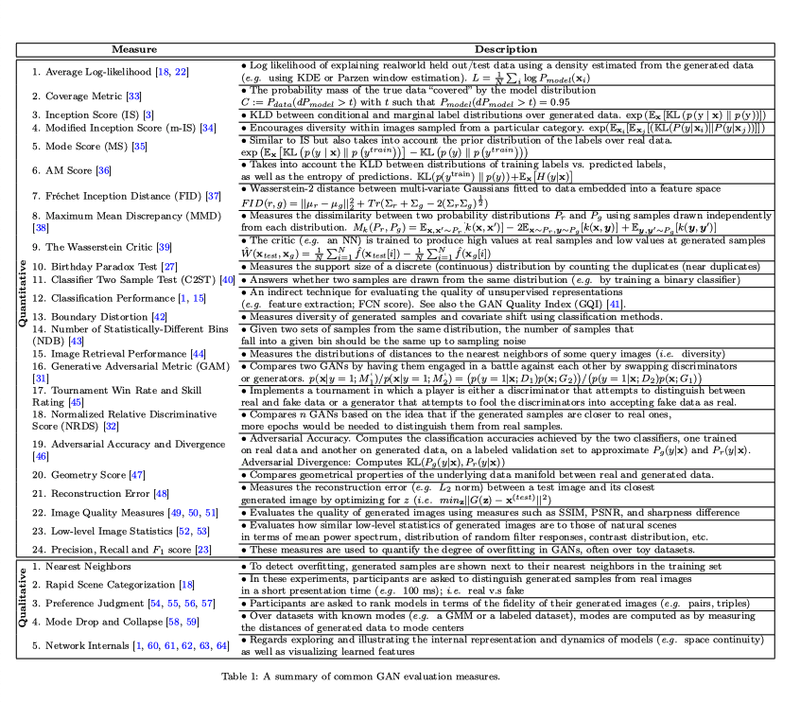 For text GANs, Guy Tevet and his team proposed using traditional probability-based language model metrics to evaluate the distribution of text generated by a GAN in their paper ‘Evaluating Text GANs as Language Models’. 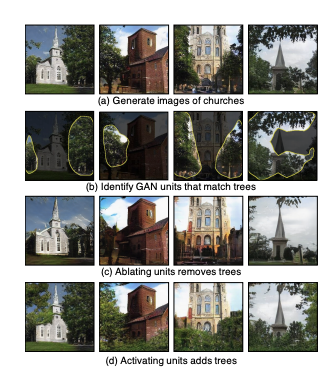 In ‘How good is my GAN?’, Konstantin Shmelkov and his team use two measures based on image classification, GAN-train and GAN-test, which approximate the recall (diversity) and precision (quality of the image) of GANs respectively. 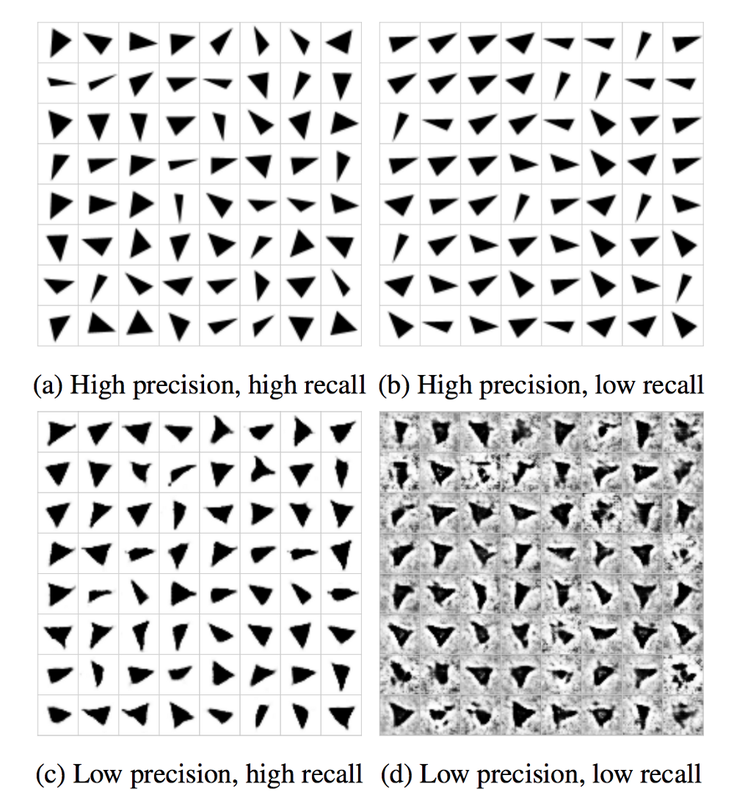 You can see these evaluation metrics in action in the Google Brain research paper, ‘Are GANS created equal’, where they used a dataset of triangles to measure the precision and the recall of different GAN models. 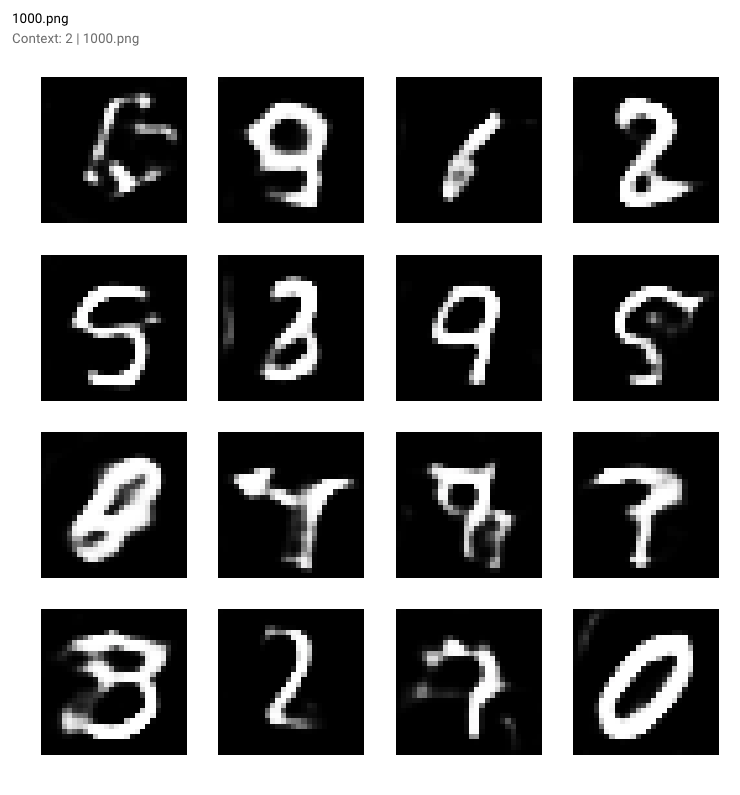 To illustrate GANs, we’ll be adapting this excellent tutorial from Wouter Bulten that uses Keras and the MNIST dataset to generate written digits. See the full tutorial notebook here. images (in this case, image of handwritten digits). 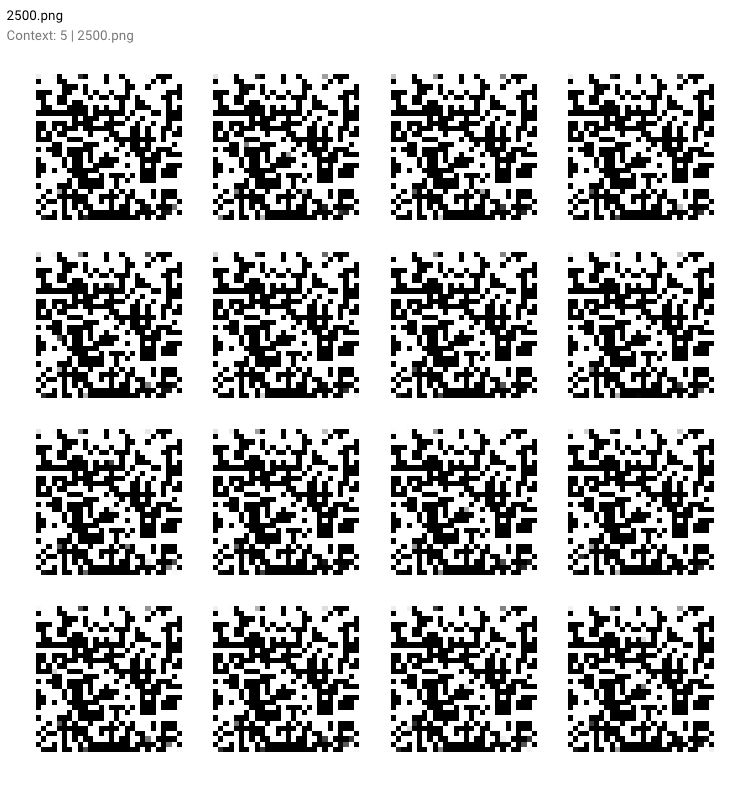 Eventually, these generated images will resemble the data distribution of the MNIST dataset. 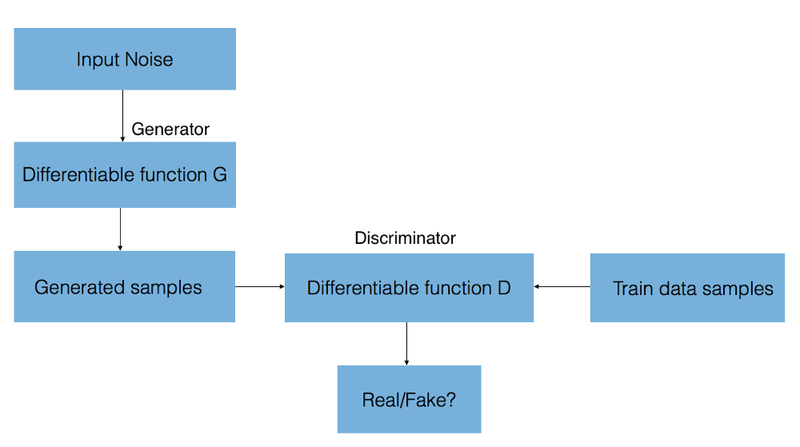 The Generator and Discriminator models together form the adversarial model — for this example, the generator will perform well if the adversarial model serves an output classifying the generated images as real for all inputs. 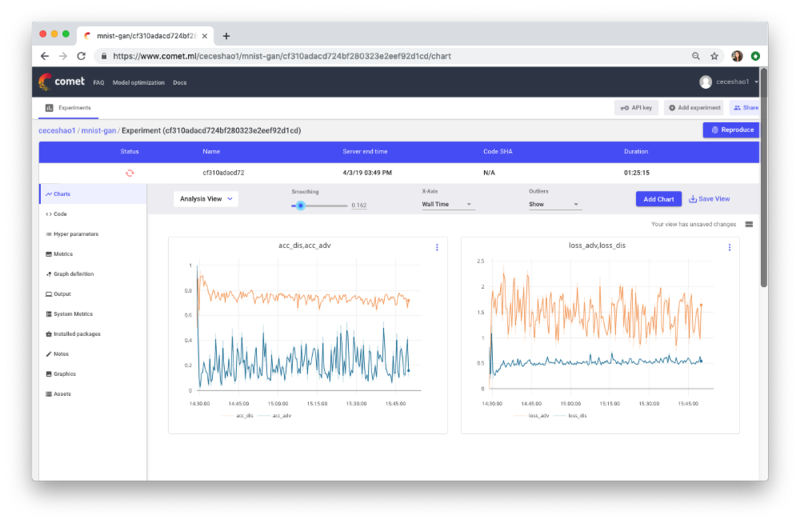 We’re able to track the training progress for both our Generator and Discriminator models using Comet.ml. See the training progression for this experiment here. 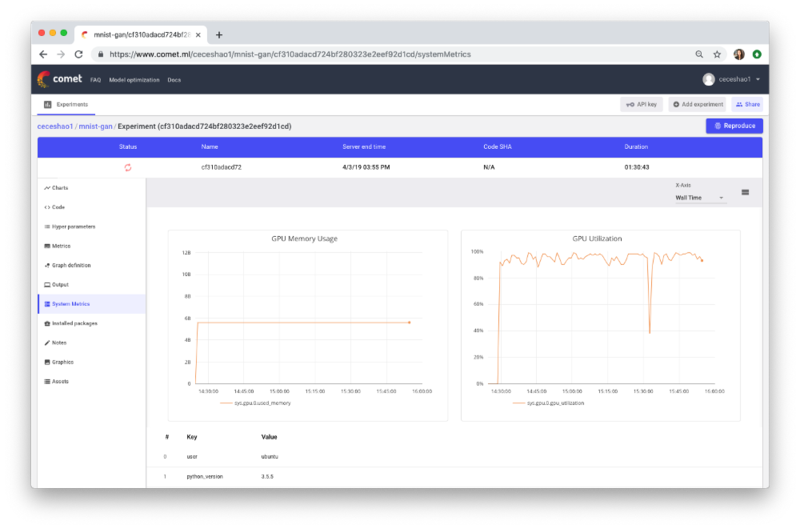 You also want to confirm that your training process is actually using GPUs, which you can check in the Comet System Metrics tab. 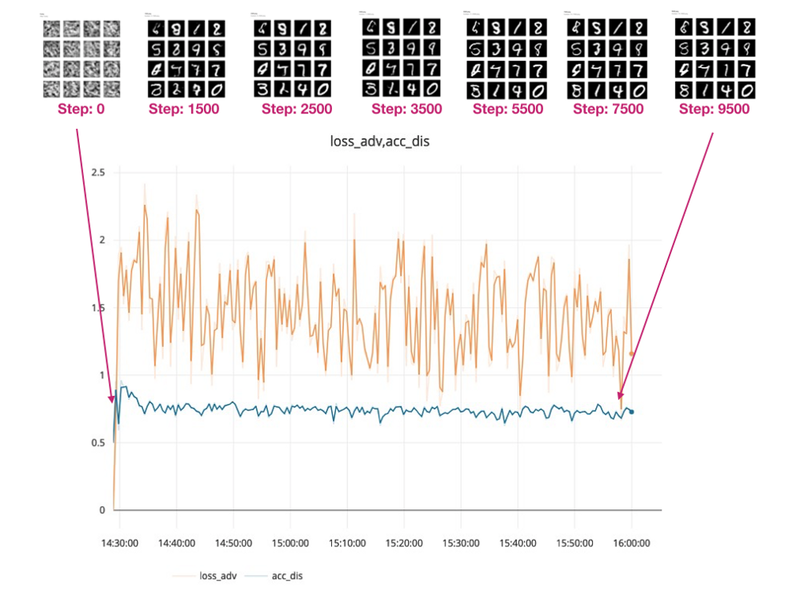 Part of the reason why we want to report generated output every few steps is so that we can visually analyze how our generator and discriminator models are performing in terms of generating realistic handwritten digits and correctly classifying the generated digits as ‘real’ or ‘fake, respectively. Let’s take a look at these generated outputs! You can see how the Generator models starts off with this fuzzy, grayish output (see 0.png below)that doesn’t really look like the handwritten digits we expect. Once our GAN model is done training, we can even review our reported outputs as a movie in Comet’s Graphics tab (just press the play button!). To complete the experiment, make you sure run experiment.end() to see some summary statistics around the model and GPU usage. We could train the model longer to see how that impacts performance, but let’s try iterating with a few different parameters. 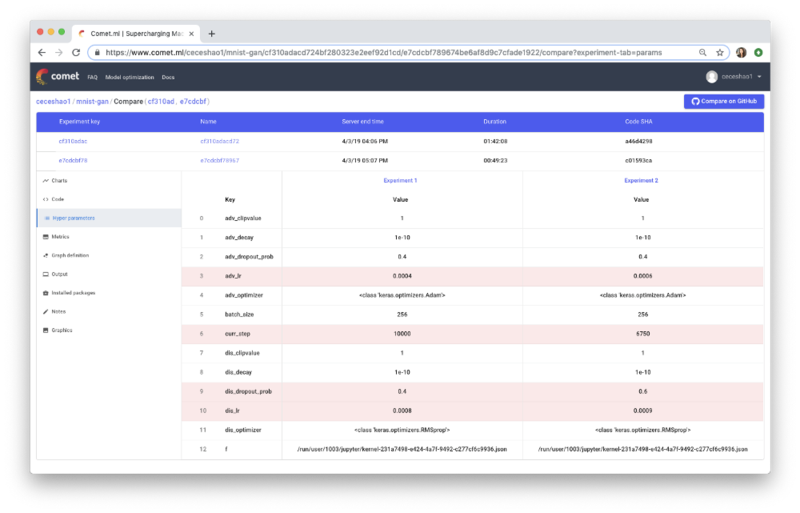 See the difference between the two experiments’ hyperparameters. Can you spot the differences in learning rate and dropout probability that we made? 👉🏼Have questions or feedback? Comment below! 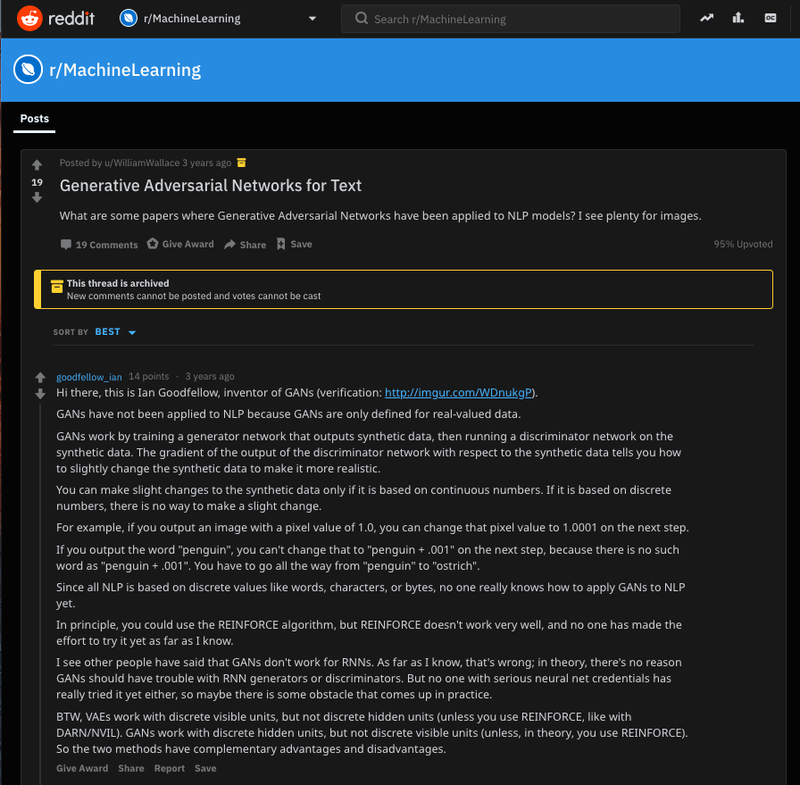 👉🏼Want more awesome machine learning content? Follow us on Medium!